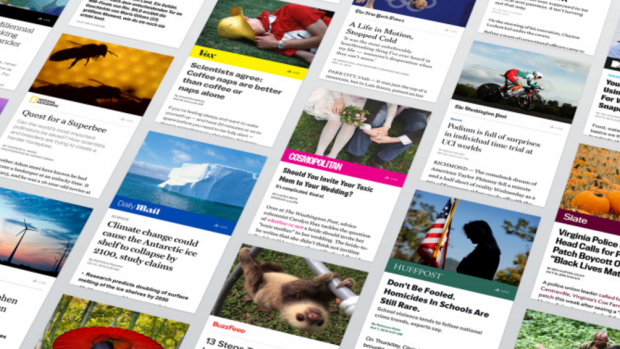 Facebook announced that on April 12, it will open Instant Articles to all publishers. This means that any publisher, regardless of size, will have this same content advantage as the major players Facebook has already catered to with the offering. If you create content, listen up! Do you plan to implement Facebook Instant Articles? Do you expect it to be an advantage? Share your thoughts in the comments. So far, Facebook has been allowing a few hundred publishers to take advantage, but this should mean a better user experience for many more pieces of content in users’ News Feeds. To be clear, Facebook says it’s extending the offering to any content publisher or blog. If you have a blog, you’ll be able to utilize Instant Articles. If you don’t have a blog, why the heck not? As we recently saw in a study from TrackMaven, blogs are frequently overlooked by businesses these days in favor of social media channels like Facebook, Twitter, Instagram, etc. But blogs can still be very effective and utilizing them more often can help you out a lot. Hopefully Instant Articles will only add momentum. You can sell and serve your own display ads in Instant Articles and keep 100% of the revenue. You can also monetize unsold inventory using display ads from Facebook’s Audience Network. You don’t have to create original content for Facebook. It’s just another way to distribute content you’re already producing. When someone shares an Instant Article on Twitter or by email, it also shares a link to your site. Beyond loading quickly, Instant Articles offer publishers some other interesting functionality such as autoplay videos that begin as readers scroll, the ability to zoom in on photos while tilting the phone, the ability to like and comment on individual photos and videos in a story, geo-tagged images, and swipable photo galleries. Media organizations and journalists are an integral part of Facebook, and we’re committed to delivering products that will create the best experience for publishers and their readers. With Instant Articles, publishers have full control over the look of their stories, as well as data and ads. They have the ability to bring their own direct-sold ads and keep 100% of the revenue, and track data on the ads served through their existing ad measurement systems, or they can monetize their content through the Facebook Audience Network. Additionally, publishers can use their existing web-based analytics systems to track article traffic or use third-party providers. They can do all this while accessing a rich suite of multimedia tools to create dynamic, interactive stories, that will load quickly everywhere on Facebook, regardless of where in the world their readers are. We’ve made it easy for publishers to join by building a system based on the tools they already use. Instant Articles uses the languages of the web and works with publishers’ content management systems, and we have documented an open standard that is easy for publishers to adopt. We encourage all interested publishers to review our documentation and prepare for open availability in April, at which point they will be able to share this fast, interactive experience with their readers. Regarding content and audience analytics, Instant Articles supports comScore attribution, and publishers can use their existing analytics systems or third-party providers like Google Analytics or Omniture. The company is also in talks with European attribution and measurement providers. Facebook also lets publishers track reader-engagement with its own analytics tools. In addition to aggregate activity data, it provides info on article reach and engagement, time spent in each article, scroll-depth and engagement with rich media assets like photos and videos. The Instant Articles themselves so far appear for iPhone and Android users. Facebook says they work for any article type from daily coverage to long-form, in-depth articles. In case you’re wondering how much work it’s going to take to implement Instant Articles, Facebook says it has tried to make things as easy as possible. You’re no doubt wondering if using Instant Articles will help you in News Feed ranking and organic reach. Facebook’s official answer is no, but I’m sure it won’t hurt. They certainly seem to favor Facebook videos over YouTube videos. The April 12 launch date coincides with Facebook’s f8 developer conference, so there will no doubt be plenty of related takeaways coming out of that. F8 registration opened up earlier this month. You can apply here. They’ll also stream the event online. Google’s answer to Instant Articles – the open source AMP (which is being adopted by a variety of other organizations) – will get its real start for users this month when Google starts sending search traffic to the pages. Between AMP and Instant Articles, the mobile user experience in general is probably about to get a lot better over the coming months. Are you going to implement Instant Articles with your content? What about AMP? Let us know in the comments.